Is Aid to Africa Doing More Harm Than Good? Aid meant to combat poverty in Africa has been complicated by corruption among political leaders, leading some to question if it hurts more than it helps. Six experts debate the topic in the Intelligence Squared U.S. series. 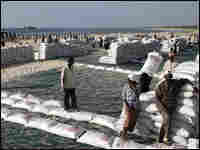 Somalis unload sacks of sorghum provided by the World Food Programme on Marka beach on Dec. 5. 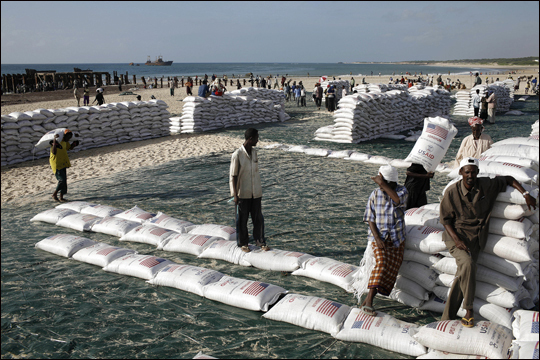 The food is destined for people displaced by the fighting in Mogadishu and living in camps around the capital. Advocates of aid to Africa often point out that, because the continent's poverty is so deep and its problems are so great, even a relatively small amount of help can accomplish a great deal. They point to cheap treatments to limit the spread of HIV/AIDS, and to others that prevent river blindness and malaria, as success stories in Africa. In the latest debate, held on Dec. 4, the formal proposition was "Aid to Africa Is Doing More Harm than Good." The debate was held at the Asia Society and Museum in New York City and moderated by Brian Lehrer, host of The Brian Lehrer Show on New York Public Radio. In a vote before the debate, 24 percent of audience members supported the motion and 34 percent opposed it. Forty-two percent were undecided. 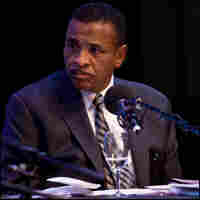 After the debate, 41 percent of audience members agreed with the proposition that aid to Africa was generally harmful. Fifty-one percent opposed it, and 8 percent remained undecided. 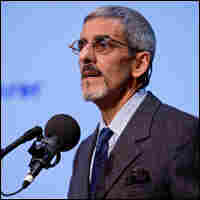 David Rieff, a contributing writer to The New York Times Magazine and contributing editor to The New Republic, says: "The problem with aid, in short, is that it sets itself up as the kind of know-all and end-all. ...Aid, by definition, is outsiders telling people in a place how to do it, and telling them if they don't behave satisfactorily — that is, the best practices that you now see in humanitarianism: if you're not democratic, if you are not transparent, if you don't do this, that or the other thing — then we will withdraw the aid. Well, if ever there was an example of any unequal form of relations, I would submit to you that that's it, which is why, precisely, in depriving people of their agency, aid does more harm than good." 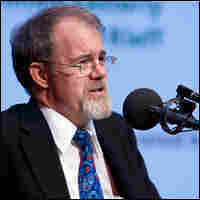 William Easterly, a professor of economics at New York University, co-director of NYU's Development Research Institution and a nonresident fellow of the Center for Global Development, says: "...We've already spent, as official donors, $600 billion in aid to Africa over the past 45 years, and after all that, children are still not getting the 12-cent medicines (to fight malaria). So there were still between 1 million and 3 million deaths from malaria last year. So aid would be a great thing if it worked. But the sad tragedy is that — and this is really one of the scandals of our generation — money meant for the most desperate people in the world is simply not reaching them: $600 billion in aid to Africa over the past 45 years, and over that time period there's basically been zero rise in living standards." "Now, we're not suggesting now don't help Africa. But if you want to help Africa, folks, please, for Pete's sake, ask the Africans what they want. Don't assume that you know better than the Africans. 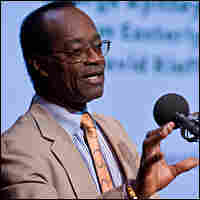 What Africans want — three things: reform, reform, reform." 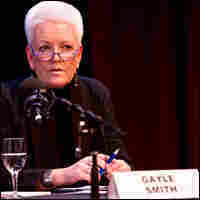 Gayle Smith, senior fellow at the Center for American Progress and former senior director for African affairs at the National Security Council, says: "This motion is flawed ... because, at the end of the day, development matters. And at the end of the day, the United States as a government, citizens of the United States, private companies in the United States, philanthropists in the United States, as around the rest of the world, I believe, have a responsibility and an interest in promoting development. I think it is a moral interest. I think it's an economic interest. I think it's a security interest. I think it has everything to do as well with our leadership. "...I would also say... if we conclude that aid is doing more harm than good, and therefore we should get rid of it, what's our alternative?" 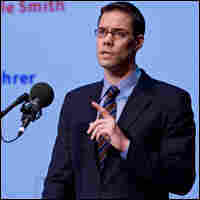 John McArthur, associate director of the Center for Globalization and Sustainable Development at the Earth Institute at Columbia University, senior macroeconomic adviser in the U.N. Development Program's Africa Bureau and former deputy director of the U.N. Millennium Project, says: "What do we get for it? We've heard that nothing, nothing has been achieved. Well, let's talk about some of those successes. There's the smallpox eradication that happened around the world, of course, thanks to, I have to say, the U.N.'s World Health Organization that set the target, set up a Smallpox Eradication Unit and got rid of the disease. "There's the fight against AIDS. In 2002, we had perhaps 50,000 people on anti-retroviral treatment in Africa. Thanks to the creation of the Global Fund to Fight AIDS, TB and Malaria and the U.S. President's Emergency Program for AIDS Relief, we now have well over a million people on anti-retroviral treatment within just five years." C. Payne Lucas, a co-founder and former president of Africare, senior adviser to AllAfrica Global Media and president of the business consultancy Lodestar, says: "One thing about Africa: It is capable of change, and that's what we're working with. We now have a woman in Liberia by the name of Johnson Sirleaf, who walked into a living hell and now is going to build a nation-state. She will not be able to build it without the help of the American community and the development community. "No, aid is (currently) not right, but we have an opportunity to change it. One thing we have learned over the years: Our programs must be owned by Africans, they must be African-led, they must be sustainable and they must be accountable."